Final preparations are underway for this year's Diwali celebrations in Leicester, one of the biggest outside India. 40,000 people are expected to pack into Belgrave Road for the switch-on of the illuminations on Sunday 8th October. There will be also music and dancing plus the return of the giant Wheel of Light at the foot of the Golden Mile. Diwali is an ancient festival celebrated by Hindus, Sikhs and Jains all over the world, and honours the victory of good over evil and brightness over darkness. People light candles and lamps and let off fireworks to mark "the festival of lights". Shops and businesses along the Golden Mile are looking forward to a busy period and to welcoming visitors from all over the UK and the world. 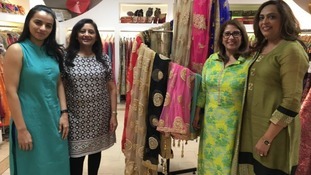 Beena Patel, who owns the Indi Kal saree shop, loves Diwali as a colourful festival which brings people together, and says the atmosphere on the night of the lights "switch-on" is "amazing". Chetan Pattni, who works at Pattni Brothers jewellers, says it's a date in everyone's calendar and a great opportunity for Leicester to show itself off to the world. At a time when the country has seen an upsurge in extremism and hate crime, Leicester's Diwali celebrations demonstrate how people from all cultures can come together in a spirit of friendship and understanding.